Today in the USA we celebrate Thanksgiving. I am truly grateful for my husband, family, friends, and acquaintances. My thoughts go out to all to have love, happiness, and good health. At times I've shared pictures of some of my family members. Today I am grateful for my husband's family. For their grace and courage in adversity. My husband's cousin delivered a baby boy on Tuesday this week. They named the baby in honor of him. George. We are thrilled and honored. 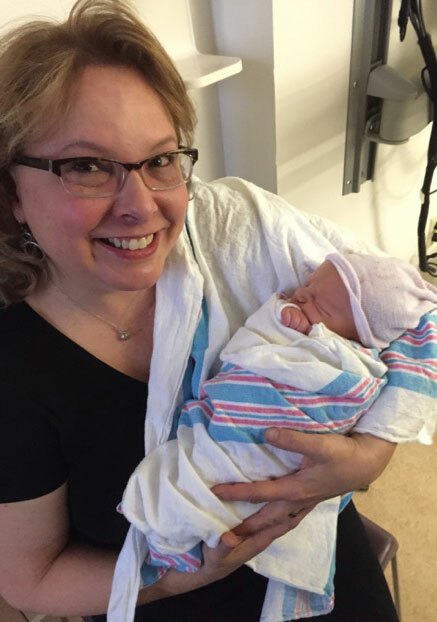 This is me with baby G. Mom delivered him on Nov. 25, 2014 at 10:19 pm. 7 pounds even. 20 inches long. All pink and perfect. The miracle in this particular family is not only baby G but also that they have a 7 year old son named Thomas who has SMA, Spinal Muscular Atrophy. It is disease that affects the motor nerve cells in the spinal cord and takes away the ability to walk, eat, or breathe. Thomas at 7 is a hot house flower. His bones are brittle, he uses a feeding tube and must undergo therapies and endure a host of drugs to be able to live. He is one of the brightest and loving little boys I've ever known. He and my hubby have become very good buddies and we are thankful for our friendship and love with this family. My husband George with Thomas. Hand in hand. Thomas seen holding his brother, George with his dad supporting them both. We remain hopeful that baby George does not have SMA, but whether or not, he has been born into a family that knows how to love and care for their family. I was not aware of SMA until Thomas was diagnosed at 1 year old. It is a devastating disease. He cannot walk, eat much by mouth, rollover, adjust himself, pick himself up if he falls over sideways (onto pillows of course). He depends on his parents and nurses for every single activity. And yet, his demeanor is strong and sharp. Funny, witty, smart and interesting with a heart full of love. My husband with Thomas on the Cleveland Indian's ball field. The irony of seeing a boy running on the right hand side of the photo isn't lost on me. It breaks my heart. Thomas giving me a big smile. His two front teeth are almost in. Yeah! Today I am feeling grateful for Thomas and his family. Live on young man, we will be here for you!